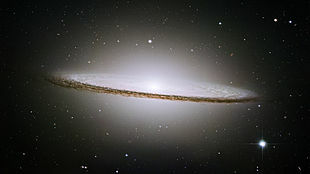 The Sombrero Galaxy (an aa kent as Messier Object 104, M104 or NGC 4594) is an unbarred spiral galaxy in the constellation Virgo locatit 28 million licht-years (8.6 Mpc) frae Yird. ↑ 1.0 1.1 1.2 1.3 1.4 1.5 1.6 "NASA/IPAC Extragalactic Database". Results for M104. Retrieved 2008-07-09. This page wis last eeditit on 8 Julie 2016, at 17:52.